Most Stanford University graduate students have never owned a John Deere product. While they’ve all heard of John Deere, when polled at the beginning of class, less than 10% of our students had ever owned, much less used, anything made by John Deere. And, yet, each and every student has benefitted from what the company does — by eating food that was made possible by John Deere agricultural equipment, by driving on roads or entering buildings that were built using John Deere heavy equipment, etc. 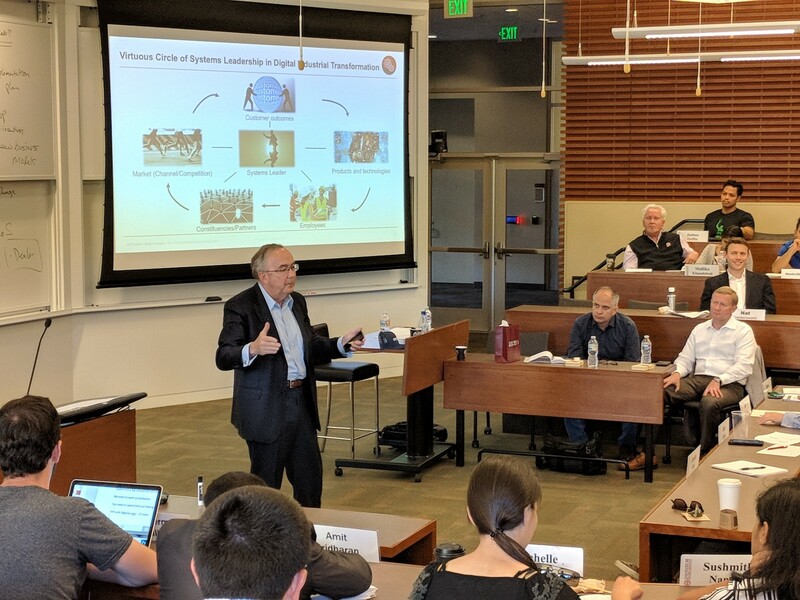 Our session with John Deere CEO, Sam Allen, allowed students to more strongly understand the outstanding digital and physical technical competencies of the company and its leadership team. Allen is approaching the end of his first decade as the leader of one of the world’s most iconic companies, and he shared with us how he and his team simultaneously manage at intersections across multiple vectors in order to make John Deere successful. 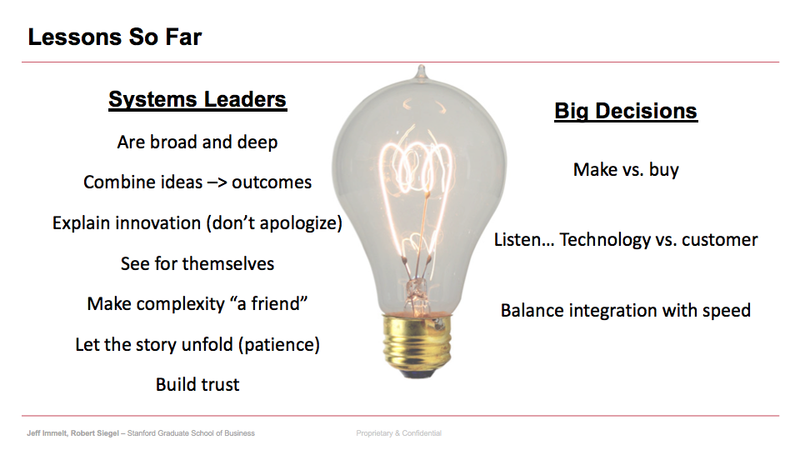 As industrial businesses increasingly blend physical and digital attributes to deliver customer solutions, the skillsets of the leaders in these companies requires the ability to manage with a set of competencies that may seem diametrically opposed to each other on the surface; yet, are critical for long-term commercial success. The new generation of Systems Leaders in the digital industrial transformation not only need to understand the virtuous circle of activities that start with delivering customer outcomes, but they also need to manage at the intersection of skillsets that historically have been held by a combination of people and not within a single individual. In the past, engineers and product managers tended to have competencies in either hardware or software — not both. Leaders tended to be good at managing entrepreneurial small environments or in managing large scale complex companies that operated on a global and often-times highly-matrixed organizational structures — not both. As customer solutions and, more importantly, the operating rhythms and competencies of digital and physical thinkers bring attributes (and blind spots) required for the future, Systems Leaders need to be able to navigate with the best skills and competencies of both worlds in order to deliver outcomes that meet the needs of customers in the near- and mid-term futures. Those who have studied corporate innovation have historically written about how companies need to simultaneously exploit existing opportunities with current businesses while exploring new opportunities in parallel. The notion that large organizations need to innovate in order to stimulate renewal and growth has been studied extensively, and experts have even written about the specifics of both how to organize and also how to create cultures that can manage both for the present and the future at the same time. However, inside of companies, the groups and organizations that have either exploited or explored have often been kept separate in order to protect each from the other; people in the “core” were not involved in new experiments, and innovative “wild ducks” were kept far away from the cash generating engines that delivered a company’s quarterly and annual revenues and profitability. One thing that stood out as Allen spoke was that he clearly has the history and DNA of someone with strong roots in the Midwest and from Deere (which he joined in 1975 as an industrial engineer out of Purdue University), but he talked as if he were running a technology company — about how hardware and software solutions help define the role of system solutions (the value of iron plus telematics, and how the developers of each try to commoditize the other even though the value comes in the integration of both), about how information coming from Deere equipment is what can help provide insights on both productivity of the equipment and best practices that can be shared with customers. Allen showed a shrewd awareness of the technical stack required to deliver customer solutions, and also a keen insight on where Deere will play in the stack. In a world where digital agriculture and construction automation are increasing in both size and scale, Allen shared a perspective of a company combining the complexity of global change which requires geographic flexibility and evolving channels that require new skillsets, competencies and financing alternatives. Allen made two points that stood out as particularly poignant. First, he talked about the importance of trust with his customers. In Deere’s mind, they clearly understand the impact of their products on customer output — if a planting cycle for farmers is normally two weeks in length, a delay or addition of one week can lead to a 7%-10% drop in crop yield. An additional delay of a fourth week can cause another 7%-10% drop. Ensuring that farmers can depend on Deere’s products to be running at critical times is key to the ultimate profitability for a year’s worth of farming work. While data and information that Deere equipment gathers can help provide insights on better ways to plant crops, erect buildings, etc., Allen highlighted that the reputation of their 181 year-old company is predicated on trust — the belief that Deere will bend over backwards to keep its equipment running at critical junctures, and the knowledge that any data that is gathered will be used responsibly by the company. Then Allen said something I’ll never forget, “Our dealers are our most sustainable competitive advantage.” For Deere, the company’s ability to be responsive for end users is made possible by their long-standing relationships with the field. He highlighted that many of their dealers are independent businessmen and businesswomen who have an existential need to run their dealership well. Or, as he pointed out, the most poorly run Deere dealers are the few that the company owns. While Allen highlighted that the ongoing nature of physical and digital products will move decision making closer to the edge (to customer endpoints), and that this will drive the company to do things in the future that they don’t do today as markets evolve, these changes cannot be done in a way that betrays the trust of those who ensure that customer outcomes are met at critical times. And for Deere, that is their dealer base. One question that arose out of the session was the need to understand what competencies one needs to be successful in organizations that are now required to deliver solutions that combine various orthogonal attributes simultaneously. Ultimately, any company that blends digital and physical products needs to have leaders at the top that can manage and understand deep domain knowledge on the one hand, as well as a competency in platform architectures that spread horizontally across multiple functions and multiple business units. While these skills ultimately converge at the level of the CEO, a team of Systems Leaders is required for an organization that is able to manage the next generation of complexities and opportunities provided by this wave of digital and physical convergence. 1) Start With the Customer — For any business to successfully deliver high value-added products and services for its customers, leaders need to comprehend at an intimate level the motivations, processes and methods of work of his/her customer base. Systems Leaders must have first-hand knowledge of the internal and external forces that shape the actions and behaviors of those who buy their products if they are going to be able effectively shape what their company delivers into the market. The lack of a detailed understanding of the drivers of customers’ actions prohibits a deep understanding which is needed to ensure that the interactions between one’s company and one’s customers are aligned in a productive and collaborative manner. 2) An Ability to Scan the Horizon While Managing Details — Too often the tyranny of the urgent forces individuals to spend disproportionate amounts of time managing inside of an organization — balancing the need to keep teammates aligned and operations working smoothly. This internal focus, however, can prevent leaders from seeing the critical events that show where a competitor’s attack will come from and also can lead to a lack of understanding of customers’ requirements. Great Systems Leaders must constantly keep in mind that “the enemy is outside of the building,” and need to split their time looking for long-term opportunities and threats, while being an authority in those areas where he/she is expected to be have unparalleled expertise. This can only be done by leaders who spend an equal amount of time outside of the company, which allows individuals to form opinions on one’s market from primary data, while also spending just enough time mastering the intricate details of one’s internal operations to effectively deploy resources in appropriate areas. 3) Manage Big and Small at the Same Time — Since innovation almost always starts with an individual or small team, Systems Leaders need to know how to function in, and how to enable, small teams that move quickly and are not constrained by existing operating rhythms and organizational structures. At the same time, for a Systems Leader to be able to rise to the highest levels of management, he/she must be able to know how to thrive when process brings discipline and enables scale of an organization. And most importantly, a Systems Leader must know how to build a team that has both of these attributes; while historically individuals might have excelled on one of these competencies vs. the other, the ability of an organization to operate at scale can only happen with a team of Systems Leaders that have the capability to understand, appreciate and embody the talent to manage both large and small at the same time. 4) Drive Horizontal and Vertical — In many industrial companies, or even in companies that play in a single market, creating unfair competitive advantage comes by knowing a tremendous amount about customers and markets and having deep domain knowledge of an industry and how it operates. On the other hand, technology companies usually seek to sell platforms that can be resold to multiple companies in different market segments without requiring customization. It’s axiomatic that service businesses “do not scale” in the same way as a “product company,” and if an organization can sell the same item over and over again it is more profitable than a service company. Businesses that fit this description tend to have higher financial multiples than those that delivers bespoke solutions. Yet, in a digital industrial world where hardware and software are increasingly sold together, and where software becomes the key to ongoing customer contact and new service offerings, Systems Leaders need to understand intimately what services customers want and need (by having deep vertical domain knowledge) and also how to deliver architectures that can be used across multiple segments and businesses in order to deliver scale and flexibility across differing customer segments (managing horizontally). 5) Allow for Different Types of People to Thrive in the Organization — In order to manage at intersections, Systems Leaders need to build teams with diverse skillsets that can blend together competencies across multiple vectors. This requires leaders to foster cultures in which those people who bring entrepreneurial energy and talent can blend well with others who embody operational discipline and the ability to manage at scale. Historically, companies have tended to favor one type of talent or the other. But, in the new world of digital industrial transformation, companies need to embrace, embody and have both capabilities working together for commercial success. In essence, Systems Leaders need to make connections between seemingly unrelated events and data, and have to understand the mosaic that confronts complex organizations and the environments in which they operate. A Systems Leader must be able to understand how a new technology can impact not only his/her own product organization, but how it might drive changes in a company’s channel and what type of partners that a company will need to be successful with going forward. And just as importantly, a Systems Leader needs to understand what skillsets, partners, and even customers, will be left behind in a rapidly evolving and changing world. Systems Leaders need to see the fluid nature with which various components interact with each other inside and outside of a company. This fluidity creates new opportunities and a constantly evolving mental model of the basis of competitive advantage in an industry. The ability to master this world can only be done if a Systems Leader can manage at intersections — of horizontal and vertical, of big and small, and of knowing how to balance these oftentimes competing vectors. O’Reilly, Charles and Tushman, Michael. “Organizational Ambidexterity in Action: How managers Explore and Exploit.” California Management Review. Volume 53, Number 4. Summer 2011. Pp. 5–22. Grove, Andrew. Only the Paranoid Survive.